After a few years I managed to put together the courage to publish it. I started writing this before exo came back with monster and lucky one ... so any resemblance to the videos and the direction the story has taken are purely coincidental (for a moment I thought SM was spying on me). The story was originally created as a birthday gift to a very special friend for the purpose of giving context to the teasers but then it began to transform into a bigger and bigger monster and for 3-4 years this story has only been read by 3 people. It's one of the longest jobs I've done and although I do not feel 100% sure of it, it's time to make it known. The moodboards in some chapters or posters as you want to call it were originally made by me. He couldn’t leave the thought of feeling watched for days. He had considered not leaving his apartment so much, but for some reason that made him feel more smothered, that's why he tried to leave constantly and it was at that moment when he felt it the most, there were even occasions when he listened to footsteps following him in some parts of the city and the sound of a camera flash, but he always told himself that they were tourists portraying the beauty of London because... It was not possible that they had found it so fast, right? That is, it would not make sense if he could escape at any moment ... disappear in matter of seconds. Despite having arrived in London a month ago, he did not want to leave so quickly, it was the most he had stayed in one place, transporting himself only when he truly felt it necessary. He knew that he shouldn't be so careless and irresponsible, if Suho found out he would punish him with the authority so characteristic of a mother not like a father but a mother. It could be said that Jongin was undoubtedly the first to remember everything, but he doubted that at some point he would have lost his memories. Since they came to earth ... he remembered everything. What he once called "home", his family, how difficult his training had been, the feeling of terror to survive, the regret of trusting the wrong people, the cruelty that can exist in the hearts of humans and above all ... the loss of leaving behind what he loved the most. He was among those who considered that Suho's idea of separating was the worst thing that their leader ad suggested. Everyone was under his "custody" and he knew they would give their lives to protect each other because they shared a bond that was stronger than any other, they had not been forced to accept each other but they behaved like a family, but that was it what made them an easy target. The mere fact of thinking abot it again generated chills all over him, most people could believe that by their attitude or even by their physical appearance he was a strong and cold person when in fact it was the opposite. He knew that in a world as perverse as this one he could not lower his guard. Jongin liked traveling so much, seeing new places and everything they offered but had to be very careful. He could not stay in one place for a long time, that was clear, because he should always keep moving, hoping to find a familiar face in one of the places he visited ... but so far it had been impossible. He thought it was foolish to think about it, the world has a large number of countries inhabited by millions of people and he was only looking for 9 in specific. In spite of his ability he knew that this brought risks, not only because it was something different from humans but because of the same energy that it consumed. 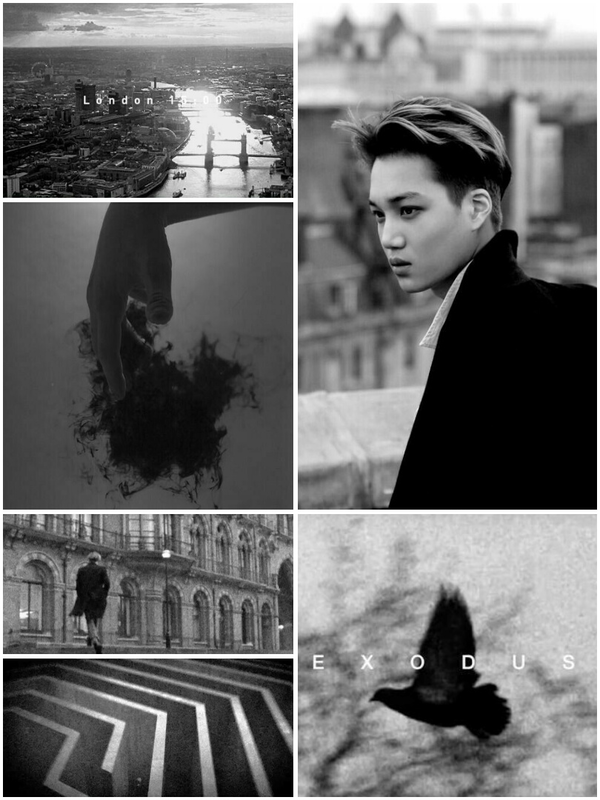 Although with the passage of time and his training he considered that he could handle it very well ... even when he knew it was not entirely true, there were things that Jongin could not control and that still terrified him, especially because even in the past not even his instructors knew the limits of his ability and it only remained for him to discover them completely. He could not obey his leader's latest rules, "Keep the use of his skills to a minimum" because at least in Jongin's case it was a necessity. If he did not use his powers for a certain time he could feel the amount of energy running through his veins as an excess and not always brought nice results. That is why the only solution was to stay in constant movement. But that's where his stubbornness appears, he loved London, the fact of being in an unknown place gave him the opportunity to explore it as something new and unimaginable, the true beauty of London. Besides the food, the perfect climate to spend it sleeping peacefully for hours surrounding it with the constant feeling of security ... there was a moment when he thought that the reason for this was that in London the summer was not very noticeable, always with clouds present in the sky without mentioning the - sometimes permanent - rains, which reminded him of Suho, it made him think that the leader was taking care of him even though he had no idea where he was. Walking through the streets of London immersed in his own thoughts, he did not realize that he had walked for more than half an hour and he now was in a very crowded place, the central square. Despite the weather, Londoners were used to it, that's why they did not worry and lived like a normal day. It happened near a few street market exhibitions that covered almost three whole blocks, but there was something that called his attention. In one of the posts he could see different types of artifacts with strange symbols that were familiar to him, that while some could find them interesting others simply saw them astral to their liking, looking like an antique stand with articles that had nothing in common among them. "Did you find something that caught your attention, young man?" Asked one of the merchants.
" ... The truth is, it's just that your stand is different, most of the items you sells are ... different." "Ahhh that's because here, you can find what your heart desires" For some reason those words made Jongin feel insecure, looking up from the artifacts he previously observed, towards the person in front of him. He was sure he had never seen him before but there was something in his eyes that made it look disconcertingly familiar. "Only the people who really need it are attracted to the artifacts that I offer" added the man and it was by saying those words that Jongin saw what the seller was holding in his hands, were platinum spheres ? ... similar to ... just at the moment when he was debating about their familiarity a strong headache interrupted him, one that as time progressed did nothing but climb, becoming stronger, unable to understand what was happening he unconsciously stepped back, pressing his temple with a trembling hand waiting for the sudden pain to left him without noticing the small smile that appeared on the face of the seller. "Are you okay ... .. Kai ? " That last word was enough for Jongin's heart to overturn, forgetting for a few seconds the throbbing pain in his head, giving another step back while watching the malicious face of the man in front to him, he did not have much time, he had to act fast . He looked around because the man probably wasn't alone but he could not contain his hysteria and did not care if other people saw him, he had to flee as quickly as possible, so without thinking it twice he ran. He ran as fast as his legs would allow him keeping his eyes alert, feeling as each pair of eyes fixed on him even though he knew that was not possible, he felt how his breathing was shaking and could not contain it anymore, he succumbed to the panic and disappeared from the place. Because everything was very sudden and he couldn't think clearly, he ended up appearing on the roof of a building 3 blocks from the market. He started walking frantically around the roof trying to control his breathing, He said Kai ... I was 100% sure that he said Kai ... nobody called him that besides ... London was no longer safe, he had to run away and find the others, he did not care what Suho had said before. They were moving again and would not achieve anything by themselves. He remember the past and definitely did not want more sacrifices, so hehad to find them again. But there was only one problem: He did not know where to start looking. What is this? Surely the wrong number ... Or maybe ... but it could also be a trap, and whatever it would end up spinning in a labyrinth designed for him. This made him remember the endless walls, corridors with no way out, the constant screaming he heard on every corner, those horrible rooms and most importantly ... Kyungsoo . He could not afford to doubt ... he had to find them, that's why without thinking, he disappeared with a thought in his head, luckily it was still Europe. English is not my first lenguage so if you found some errors please let me know. He didn’t keep track of the days he spent in that cafe outside the city of Barcelona, despite being small and cozy and the coffee they served was simply delicious even if he wasn’t a coffee lover himself. Even though he still did not remember all his past, he knew there was a reason why he was alone, even if that was one of the things that scared him the most ... besides ghosts and insects but that was not very important. It was a little difficult to realize that he was different, that he could be special. He was in one of his martial arts classes when he noticed for the first time. He was struggling with one of the professors who, according to him, "Tao had a talent born in martial arts" so he decided that the best way to prove it was an unrestricted encounter between them ... even if it was his the third class. Tao did not know how to react to the sudden attacks of his master but, before realizing his body seemed to move by itself, as if he knew what to do in those situations so he knew how to handle the fight in his favor. The practice made him realize that in reality his opponent was very good at what he was doing, that is to say he master after all, but even so the boy was able to intercept his attacks and in a matter of seconds after a few hits he realized that he was being able to read the movements of his opponent. He identified his master's way of fighting, a bit aggressive but very agile. He was probably very excited in the confrontation that he did not notice the moment his teacher made the signal for the rest of the class to attack - "as part of the training" was at that moment when the situation got a little out of hand even if it seemed that he could dominate the fight, he was fighting against his teacher and five other students, it did not help that the students of the most advanced class were there. The moment one of them attacked with a wooden stick and the rest decided to also attack, his heart began to beat faster feeling the adrenaline rush through his veins but even so it was not enough, his opponents were fast and he knew he could defeat them separately but facing them all at the same time was too much, it was at that moment that he closed his eyes and a thought crossed his mind, "Slow down, I need time to prevent the attacks". The attack he expected never arrived, he opened his eyes and saw that everything seemed to have frozen. He had no idea what had happened or why he was the only one who was not affected by the strange phenomenon ... Maybe it's ... no, it can’t be. I ... Am I responsible for this? …Is that possible? He walked to the clock that was on the wall at the other end of the room and stared at it while trying to concentrate: Move, move, move! The moment the needles seemed to move again he heard the commotion of what happened behind him. “What happened Tao? How is it that you are there?" The young man didn’t know what to answer but he felt a little dizzy, and confused with what had just happened. He excused himself from the class saying that he did not feel well and left the place as quickly as possible. It was after that event that he realized that it was not normal, at night he had those strange dreams that with his recurrences he started to doubt if they were dreams and the idea of memories came to his mind. His companions or rather his family and ... Who did he forget? There was a reason why his heart was not calm but he didn’t know with certainty what it was, he still didn’t recover all his memories. For some reason he had found a little warmth inside the small cafeteria, there were times when he was absorbed in his thoughts and he felt he could remember little things like, what was his favorite food or some physical trait of different people he assumed were his companions and although not all of them were happy he felt that it was better to remember everything at once. That was another reason why he was there again reading the newspaper, he thought his day would be quiet as it had been for a few weeks. The headlines of the news that covered the first pages showed him the opposite: "The comet is appearing in ten cities around the world." Comet? Reading the rest of the news he knew that it was not a normal event, the sun and the moon aligned, specific cities, what was special about them? ... Was this what he had been waiting for? There was an ancient prophecy that Suho repeated to them all the time but it was uncertain whether it was true or not ... wait…Who was Suho ? Why did that name come to his mind? He considered that it was due to the number of thoughts that crossed his mind at that moment that when he heard how one of the coffee shop lights exploded, his feelings became more intense and he activated his power without him realizing it. If everything started to move again it meant that each of the others were in danger, including himself, he took one last look at the paper and memorized each of the cities mentioned in the news article and just in case he took a picture with his cell phone. He got up from the table and looked around, he did not have much time. Before he leaves there was something that caught his attention, at the nearest table was a man reading a book but ... his gaze was set on the spot where Tao had previously been sitting, who had been so focused on the newspaper did not notice he was being watched. The young man approached that person and what he discovered made him run out of that place. The man had in effect what looked like a book, but it was only for appearance, instead of finding the letters of a normal book Tao found a number of annotations on the blank pages, his photograph and the name of certain cities: Berlin, Edinburgh, Marseille and the last of them Lyon, which was followed with only one word: Found. English is not my first lenguage so I'm sorry for the mistakes. Everything was engulfed in flames again. He didn’t know if the sudden headache attacks had influenced something but he knew it was not normal. His whole apartment burned in the heat of the fire, but that was not what worried him, the strange thing was that he felt no pain and much less fear of being caught in the fire. On the contrary, he felt a certain familiarity in it. Even when the temperature rose more and more and everything around him was destroying little by little. It was at the moment that the anger and despair he had felt a few minutes ago began to fade. Not knowing his past entirely infuriated him, he had spent days with the same dreams but could not remember anything clear, it was as if there was a barrier in his head that prevented him. He knew he was close to remembering something big but could not get anything and it was in those moments when the headaches returned, this time more intense than before ... it was there when he could not control his emotions and he got angry. He started throwing the cup he had in his hands. He needed to get it all out at once. He began to destroy everything he could find, from books to the furniture in his apartment. When he took one of the cushions and threw it with all his strength to the wall it was consumed in flames, he had no idea what was happening. He looked at his hands, which were beginning to feel warmer than normal and he returned his gaze back to the wall, which started to burn in flames as the floor of the apartment, being carpeted it did not take long to scatter the fire. Everything happened too fast that he did not have time to react. Even if he had lost most of his things in the fire he did not give much importance, he had never considered himself a materialistic person, well at least in what he remembered. Moreover, even the people around him told him that he was a cold person without feelings, it might sound strange but for a moment he truly considered it. For some reason he felt a void in his being, something that did not allow him to be happy although he associated it with his poor memory, that is, how can someone be happy without knowing himself completely? He did not even remember many things about his past. That's why he was determined to retrieve all his memories, it was likely that maybe, just maybe that's the way he could be happy. That is why after the fire Chanyeol had to move. He decided on a place far from everything he knew and above all, far from any emotion too strong that caused another attack as he lived, opting for a small cabin in the woods that gave him all the tranquility he needed. He could have stayed in the city, even his boss had been very understanding that he offered to increase his salary in what he recovered everything he had lost, however decided to resign. In addition another factor that impelled him to leave was fear. The fire had been his fault, he was aware of it and worse still that he had not been the only person affected. Fortunately, when the commotion passed with the authorities, they declared that the real cause of the fire had been a gas leak, but the young man knew that it was not true. He knew that everything was caused by an impulse and uncontrolled anger, especially because that was not the first time something like that had happened. After moving, he used the days to understand the nature of his ability, at the beginning it was very difficult because the first time he was aware of it was because of an impulse and the second time because of frustration. It was there when he realized that in a certain aspect his ability could be related to his emotions, so he focused on concentration and tests with different possible situations. Being all day practicing exhausted him at the beginning, he could not help it since it was something new for him and consumed his energies very fast. There were times when he got discouraged because he didn’t find a real purpose in why to continue with the same routine every day, yes, it was important to master his ability not to hurt more people in the future but ... he felt that there was something else that was intended to discover. That is why when he felt reluctant he decided to invest his day in other activities but once the sun went down and his surroundings began to get dark he lit some matches with the idea of seeing them burn, but ... it was not the fire that he liked , but the light that it gave off. It made him feel safe, calm and strange that it sounds, beloved. 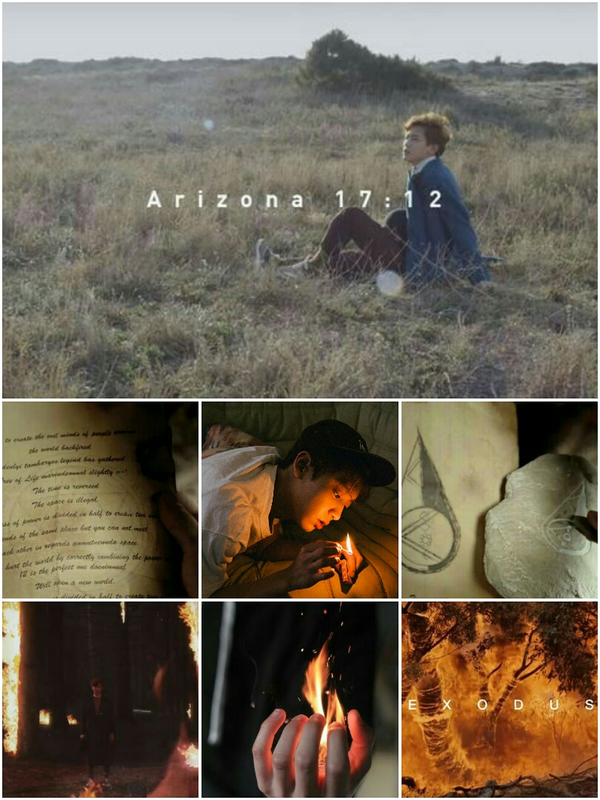 It was in those cases in which Chanyeol abused a little more of his power, he sat in the small improvised room of the cabin and with the palms of his hands he generated enough fire for the light that it formed to completely envelop him, the sensation of feeling safe and peace surround him. He realized that the new environment he was in was better, without the noise and distractions of the city. What he loved most was lying down after an exhausting afternoon of training – that’s how he decided to call it after becoming something like a routine - and see the sky full of stars in addition to the bright moon at night. Although not everything was rosy, he had nights when nightmares would not let him sleep, random images of other children and many screams ... a series of disturbing events that made him wake up suddenly. He didn’t know if they were simply dreams or ... they were some of his memories, if it was the last thing he did not really want to recover his past. After several days with the same kind of dreams that the only thing that left him was a bit of fear and fatigue for the rest of the day, he made the decision to avoid sleeping to keep the nightmares away from his mind ... Obviously that was impossible, so without thinking he found a solution. It was a night when the sky was full of stars that felt relief in his heart. He could not explain it was just ... beautiful, it was at that moment that he felt his heavy eyes demanding rest that he slept in peace. From that night he took over his favorite place in the forest to contemplate the sky once the stars appeared and to be able to sleep peacefully under the light of the moon. Sometime later Chanyeol found himself addicted to one more thing: the sunrises. It was as if his body knew the exact time when the sun would rise and wake him up with enough time for him to walk to the exact place where the sun rose and enveloped everything with that wonderful light. It was beautiful ... but at the same time it was painful ... and despite how much he tried to relate something-or someone- to that feeling, it was impossible. After a few weeks he realized that there were parts of the forest that he still did not know, so he took a few days of "rest" and set out to walk without an exact path, he just wanted to know more about the forest that had become his home. He had been walking for a long time and thinking about the memories he had managed to recover that he didn’t notice the moment when a kind of ruins had appeared in front of him. It could be said that before the place had been majestic, but now it was in a state that made it seem very old, in a deplorable state. He walked by what he thought were once big buildings, probably houses or who knows, they could be the rubble of an old castle. In one of the buildings he found what appeared to be the remains of a house, or so he thought. Filled with strange objects and full of vines covering the walls. His curiosity did not leave him alone so he began to observe more carefully some of the objects, he sat in one of the boxes that were nearby and saw that at his feet was a kind of diary. He took it in his hands and began to skim through it, the pages had a smell of damp and they were yellowish due to the old, his paste was covered in leather which explained why it was still in a decent state. A strong breeze made her realize that the sun was setting and it would be best to return to the forest, but as he began to leave he realize something else. At his feet was also a kind of rock with strange symbols. When he picked it up he saw how it was very similar to one of the drawings on the pages of the diary, when he began to compare them was when he realized that this seemed to shine and began to increasing its intensity with every second, so much that he was forced to close his eyes, it was at that moment that a series of events crossed his mind, feelings of anguish, emotion, pain among other things, was too much that the last thing Chanyeol could remember before fainting was a single word, or rather a single Name: Baekhyun. It took him longer than necessary to return to his apartment because of how tired he was ... besides that the bar in which he had spent the last two hours had to close due to the "sudden climatic changes". The manager of the bar had suggested that he return home so that he would not run the risk of catching a cold, as if the weather would affect me. After taking the train back he still had a long way to go, that's why he always brought a skateboard with him, it was more comfortable than a bicycle or a car ... although he preferred not to spend too much on a car, and he couldn’t afford to spend too much money. He had to admit that Berlin was undoubtedly a beautiful city and really wish he had the time to visit it as it should, to pass by the Museum Island or the Unter Boulevard of Linden, according to what the citizens said, those were places that any tourist should visit ... if not because all the time he felt like a fugitive, having to take care of his back every day without being able to lower his guard. In addition, he tried to keep a low profile and not attract attention, a good reason why his apartment was on the outskirts of the city. It was 5 o'clock in the morning when he was finally approaching his apartment, but he could not help but feel defeated again, had spent days looking for some clue, some kind of trail that could help him find the others but nothing seemed to work. They had no time to lose, they were wanted and persecuted again and in spite of the risk Minseok believed that the best thing was to do everything possible to return, obviously with a strategy in mind, this time the goal was not to be captured but to infiltrate, it is the least he could do for those who stayed behind. The others might not agree once he told them about his plan but ... he had to do it, he felt a certain responsibility and guilt every time he thought about it, besides making him feel lonely. Yes, Suho was their leader but Minseok was the oldest of all and that was probably why he also felt that his duty was to keep others safe, they were a family after all and no one appreciates seeing their family suffer much less than his brothers, it is an inexplicable bond that only they were capable of understanding, and he was sure that those who left behind felt it too ... that was the reason why everything happened. 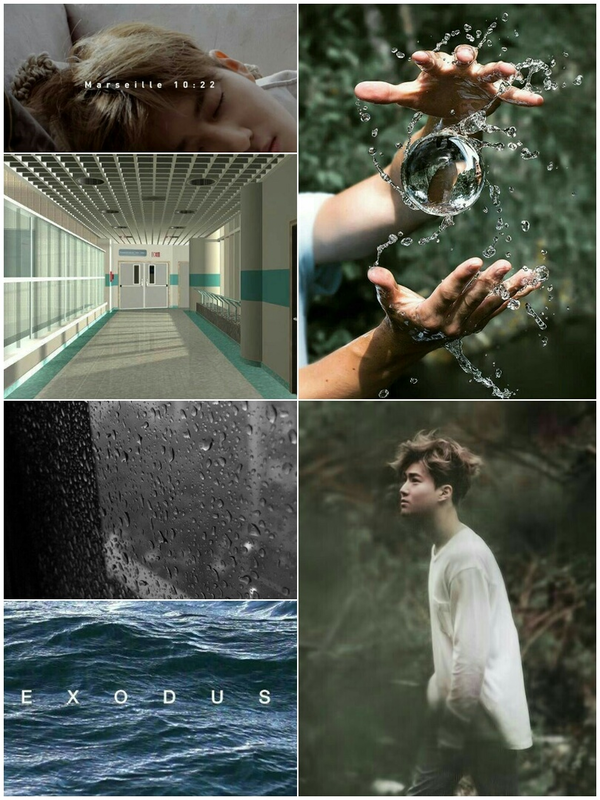 Kris, Luhan and Minseok were tired of seeing how they all suffered and some were even tortured at the hands of those people and being the oldest the only thing they wanted was to protect others, it was obvious that Suho felt it too but ... he was the one with his hands tied ... they all had a weak spot and they quickly found their leader's. That is why even with difficulties they planned the way to escape. Everyone was aware that Minseok was a reserved person but still cared for them, and even though his power did nothing but freeze everything around him there was only one person who managed to keep his heart warm. He shook his head trying to push away all those thoughts that covered his mind, he could not afford to think about that now. He had tried everything these past few days, but his patience was running out and he felt desperate, which is why he had spent the whole night frantically traversing every corner of the capital going further and further, but he did nothing but exhaust his energies without getting rid of the the grief in his heart. The only thing that kept him distracted at the moment was music. Even if he knew that it wasn’t the voice he really wanted to hear in a melody but he could not do anything but resign myself. He had enough for the day, he was tired and with every step he took he did nothing but lose hope. It is when he finally managed to enter his apartment located on the third floor of the building that he felt he could not take it anymore. This one was very large, or at least it seemed that way because it lacked furniture. He did not consider it necessary to try to make it look like a home when he knew he was far from it, it was enough with a kitchen, a place to sleep and just because it was part of the room, he had a TV and a sofa in the center of the room. Although they had always considered him to be the most orderly and neat member - he wanted to order everything within his reach to combat stress or anxiety - now even that could not calm him down. That's why his apartment was with garbage on the floor without mentioning the number of phone directories from different countries that he had acquired, it was not a bad idea looking in them also for any track ... although he was not surprised when he found nothing, a part of he was relieved that at least none of them had been so foolish to register and make himself known very quickly, but on the other hand he was disappointed to end up empty-handed. In spite of how tired he was, it was difficult for him to get to sleep, so he went to the kitchen for a glass of water and after crossing out more places on a map he kept on the table, collapsed on the sofa. It was too early so he stopped going through the channels without even being fully aware of what he was seeing until began to feel his eyes closing on their own. Just as he began to relax and close his eyes completely, the sound of the television made him startle quickly, focusing on the little attention he had on the device in front of him. The sound was for a static on the television, what's wrong with this thing? What appeared seconds later made his dream and tiredness vanish completely. He could identify different images distorted by static, landscapes and random objects, he did not understand what was happening and he considered turning off the television until a clear image appeared in front of him. The feeling did not last long as a lot of thoughts attacked his mind. Who is sending these images? Is in danger? I cannot tell where it is, the only thing I see is ... a church? ... Where are you Jongdae? Can you ... can you remember me? The next thing that came to him was anger, the despair of not being able to find him, the fear of being found before him. If any of them dares to touch a single hair of Jongdae again ... The feeling was too predominant that he did not notice the moment when the glass still in his hand began to freeze. The static returned, distorting the image again, with what seemed to be random places, among them could differentiate what seemed a word, came closer to differentiate it by supporting his hand on the TV screen and knew he had a new direction to the What to do: Edinburgh. No, no and no. Nothing. He was beginning to believe that someone was playing a joke on him and he had been too stupid to fall for it too easily and now he had to deal with the feeling of defeat ... again. A few days ago he had begun to receive a number of strange messages on his cell phone. At first he tried to ignore them, believing that it was a mistake of the same telephone company or just wrong number, but when they became persistent that he even received two messages from them at the same time, exactly at 3 in the afternoon with 25 minutes, He began to believe that something strange was happening. What seemed most strange to him was that the messages seemed to be only numbers, until after spending hours thinking about what could be treated, he discovered that they were coordinates. He had to resort to external help to decipher them and know what was happening. Despite everything that had happened, he still was not so sure about who he really was. He had thought he was a normal college student, with mundane problems to worry about, or so he believed and it was real for a while. Until he remembered everything, and once he did ... his whole world collapsed. He left his studies and began to hide while fighting with himself every day. He was not entirely happy to remember his past. Who wants to remember what it feels like to see the people around them die, lose their family not once, but twice and the worst ... lose part of their heart. Sehun spent very difficult days in which even the only thing he thought was to end everything once and for all. What did his life matter? If the only thing that remained to remind him that everything had not been a bad dream were the countless scars that ran all over his body, before recovering his memories he had believed that he had some kind of accident ... he would have wished it were so. And that pain, that horrible pain in his heart that made him wonder if he could ever be able to smile again. The only thing that stopped him was that he did not want the sacrifice of his brothers to be in vain ... No, he should not think about that. Luhan was still alive ... He had to, He could feel it. After several days of what he called his "dark days," he began to believe that maybe there was some hope, he had to find Luhan. He had no idea how, but he had to, especially when he started receiving those messages. He tried to decipher most of them and after thinking about it very well he decided to go to those places, starting with those who were closer to his house, there must be a reason why he received such messages, right? As expected, exactly when the clock struck 3:15 in the afternoon his two daily messages arrived. However ... most of the time the coordinates took him to places a bit desolate, but they also used to take him to places that brimmed with people, like tourist places and parks. However, in some of them he found strange things. On two occasions when he arrived at the place indicated by his map, there were policemen in the place trying to clean up a crime scene. They said they were murders but ... Sehun was not sure about that. The scene was full of a strange black thing around the bodies, the young man was not a doctor but he knew that it was not blood. He could not believe it ... could it be...? It was only a matter of seconds when he was out of his house running through the streets in the direction indicated by the coordinates. He did not even bother to call the number from which the messages came - he had already tried since he noticed the pattern at the time he received them, but always the voice on the other end of the line said that the number he had dialed did not exist. And the messages he received were always from different numbers. He was surprised to realize that his destination was too close, in fact it was a few streets away from his house and just like the other times, the place would seem to be desolate. It was in what looked like a community like the typical suburbs, however, he did not know if it was a matter of time but the streets were desolate. A few cars parked at the exit of their houses but otherwise ... empty. The houses were exactly the same on the outside, the only thing that differentiated them is that some families chose to decorate their doors with different styles and in addition to the house number, and there was no other difference between them. One of the coordinates took him to one of the houses that seemed to be empty, it was not safe but the garden was rather neglected, a lot of newspapers were at the foot of the door of the house and a few bottles of milk next to them, which indicated that if in any case there were people inside that house they were absent for days. Curiosity was mortifying him, so he checked his surroundings very well before forcing his way into the house. He found nothing, absolutely nothing, which was why he was frustrated from the beginning, he was hoping that this time he could have found something that would be useful, especially after that message. That little "Han" at the end of the message had made his heart contract and give him hope. He left the house and crossed out the place on his map. It was at that moment that he realized that he had entered the wrong house, the euphoria of the moment did not let him think clearly and he mistook the numbers of the message. He turned around and found the house that was truly his goal. When he reached the door he considered forcing his entrance as in the previous one but ... it did seem to be inhabited for the moment, so he tried to open the door in a normal way, surprised that it opened easily. He knew that it could be considered a crime to enter an unknown house in this way, but it was not the time to think about what was right and what was not. The atmosphere inside the house was strange, as if something was not right in it. He entered a little more and stopped short when he saw a toy airplane suspended in the air, at first he thought that it hung from the ceiling with threads but he used his power to move it and only turned in the same place ... like it was floating ... he only knew one person capable of doing something like that. He moved quickly to the living room of the house but instead of meeting with whom he expected, he saw two children in front of him, they looked like about 10 years old... they ... were at the center of the room with toys floating around them. When they noticed Sehun's presence he was paralyzed ... his heart and mind bombarding him with different feelings, he was so distracted that he did not realize that at one point one of the children had stood up, walked towards him and took his hand, startling him and letting go of the child's grip, he try to put distance between them. Looking at it closely the boy looked ... sick, with his skin very pale, his lips of an almost purple color, he saw how his hands trembled uncontrollably at his sides and his body, the child was small in stature but too thin, making him look too fragile. Did they not feed him well? 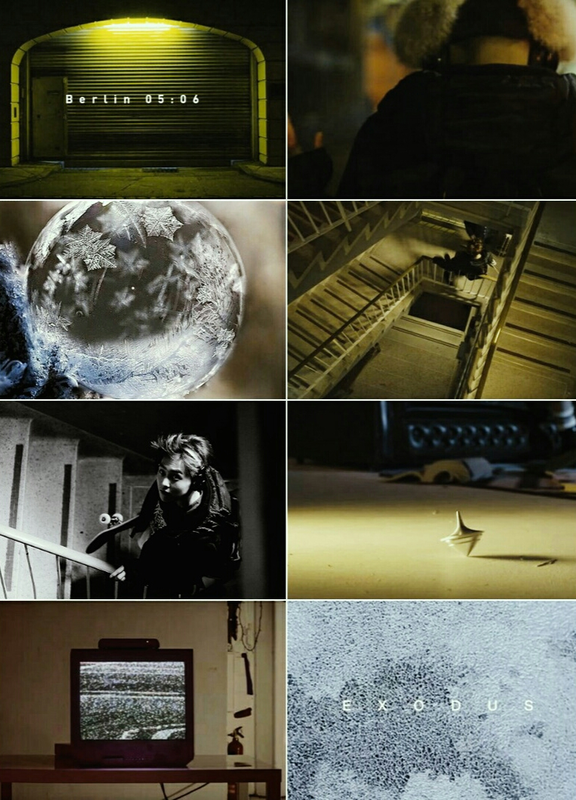 “You have to get out of here, before they come.” Sehun did not have to think twice before running out of that place, not without first realizing that both children were bleeding or something very similar to it. The one who had approached him first looked more tired and a strange black liquid was coming out of his mouth every time he coughed, while the other child began to breathe forcefully and similarly that strange liquid began to come out through his nose. Sehun ran to the exit, looked around and everything seemed the same. But he could not trust anything, he tried to go back to his apartment but just when he was going to cross at one of the corners of the block he hit something, and because of the speed at which he was running plus the impact, it was too strong for both him and the person he collided with, they ended up on the ground. When he tried to rejoin, he realized that he had collided with a young man who was trying to get up quickly in the same way. It was when the stranger turned around that he forgot completely why he was running in the first place. He was in that room again. The only thing that could make a difference in that dark place was the door at the end of the hall and a table on the left side, above it was a glass with water, paper and pencil. On his right side there was a wall with what appeared to be a glass wall, Suho thought it was a mirror because it looked the same reflected in him but a voice in his head warned him that he was not alone. His reflection did not surprise him, he felt weak, tired and especially defeated and it was exactly what it reflected. He could not do anything but wait, since he was tied to a chair. He knew exactly what it meant and the mere thought of it made him shiver. He felt fear begin to spread throughout his being, he could not believe that this would happen again ... he had believed that the web of lies he had said the last time had been enough to leave them all alone. It was his duty to take care of everyone and he did not even feel it as an obligation, he did it because it was what he wanted, it was his family. His thoughts were interrupted when the door opened suddenly and Suho knew what he would see. One of them entered the room. It was easy to differentiate them, dressed completely in white pretending to be "doctors". Suho knew the truth, they were scientists and he knew that when they appeared it was not a good sign but the opposite ... something bad was going to happen. Suho could not avoid the panic he felt in front of these people, especially when it was he who refused to reveal his abilities to them. They were scientists who only went under rumors and the young man had the hope that if they did not do anything out of the ordinary they would let them go ... he had to keep his hopes in it. But he knew that was less and less likely. “Well… I suppose we have no other choice.” There were sounds on the other side of the room and what the young man thought was a mirror turned out to be a crystal division. A light revealed what was on the other side of it. Suho could not contain the exclamation that came out of his mouth when he managed to differentiate the scene. Two tall, sturdy men dressed in white uniforms entered the room, their faces covered with masks. Their uniforms were different from those of the scientists so they looked like guards. What made Suho squeeze his hands tightly was the young man they brought in his arms. “My ... my ... what?” Before Suho could refute or claim he heard screams from the other side of the room. His eyes went quickly to the sound and he regretted having done it, he knew what was going to happen ... They would torture Yixing until he spoke. “No!! ... Enough! Do not hurt him! What are you doing to him? !” He tried to get up from the chair and move his arms but the ties did not allow it. He felt useless because he could not do anything to help Yixing, he knew he had his power but he could not reveal it to them. I he did so, all his efforts would be in vain. The shouts from the other side of the room stopped, but Suho's heart beat a thousand times an hour. He could see that the two guards still held the young man by his arms, proceeding to drag him to a chair and leave him in the same conditions as Suho, tied to it. One of them held a syringe in his free hand and the other held a device that Suho knew very well, it was a stabilizer that electrified his body, which they had just used ... he did not want to know what that injection would do to him. He had to do something soon, he could not let them keep hurting him. “The only thing you have to do is talk to me Suho ... otherwise.” Yixing's screams intensified more and more. It was the sound of the alarm that woke him up, he sat up looking around, but in spite of it the images kept playing in front of his eyes, because it had not been a simple dream but a memory. A very unpleasant memory. It was the first night in days that he allowed himself to sleep and this kind of dreams attacked him again making him feel more and more tired. His apartment had books, papers and documents everywhere, he needed answers and the eclipse was getting closer, which meant he had less time. Especially when he felt that each time he got closer to the answers he needed, they moved away again and left new questions to be answered. He got up trying to dispel those memories from his mind. Once he got to the bathroom and saw his reflection, he could see that not only did he feel tired, but he also appeared to be tired. He was sure that if the other members saw him in that state they would make fun of him. Surely Baekhyun, Chanyeol and Jongdae would spend hours and hours bothering about how he had aged so much in a short time that even his hair would turn white in a matter of days being the grandfather of all. Kyungsoo would only roll his eyes and he would not give much importance to him, if instead the jokes had been towards him, he would make sure that Chanyeol and Baekhyun suffered the consequences. Jongin surely would not notice it because he would be somewhere sleeping. Kris and Sehun could put their stoic faces pretending that nothing matters to them. Tao would try to defend him ... after laughing with the others. Minseok and Luhan would only be relieved by the fact that despite being older they would look younger than him. And Yixing ... Yixing would try to cheer him up even though he knew Suho did not really get mad about that kind of thing. He could not afford to think about that kind of scenario again, it just made him feel sadder. He had spent the entire week in his apartment and decided he needed a change of environment. 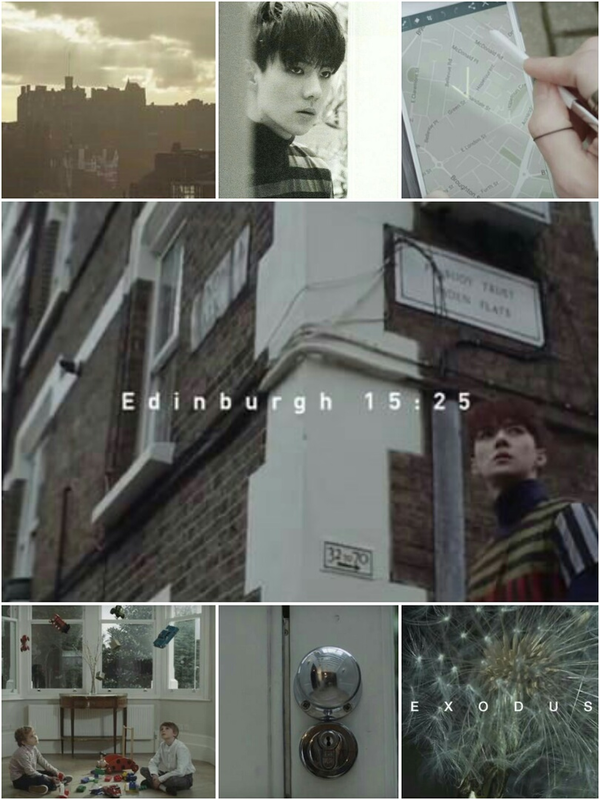 He always kept alert about his surroundings, that is why his "home" was located on the outskirts, it was not very difficult, since the same city was on the shores near the sea, in what for some people was considered a place abandoned, Suho made this seem habitable. It had been an old cellar and the young man took advantage of one of the cameras to make it cozier. He got the necessary furniture and installed himself, although now it could not be appreciated because the mess but it was a beautiful and spacious place. He had to accept that the more time passed, the more depressed he felt and ... the loneliness ... it was not something that was pleasant either. He thought he had made the best decision by asking everyone to part but, it was probably the worst idea that could have crossed his mind. One of the real reasons why he had asked for them is because he could not bear to think that he could ruin it again. After all, he was the one he blamed for everything they suffered. It had been his idea to look for any source that would give them answers about the prophecy and the events that would happen in the future with such ambition that it led to dangerous contacts, and blinded by the emotion failed to see the imminent. After falling into the hands of that terrible organization that the only thing they wanted was to study them like laboratory rats, their hands were tied. He could not afford to use his powers and escape, he had to get them all out of there safely ... but at the same time that was the problem. The place where they were prisoners was huge without mentioning that after a while they began to isolate certain members. If not for Luhan, all the escape planning would have been impossible ... and even when they thought they had the perfect plan ... not everyone could escape. Suho knew that the fault of everything had been his, that's why he tried to do everything possible to solve it now. When leaving the cellars he found the forest that surrounded him, he supposed it was one of the reasons he felt more comfortable, being surrounded by a large forest made him feel safe. Passing through the middle of the trees he could feel it. The humidity in the environment was making his power increase, though a second thought crossed his mind: The comet. According to the legends there were two possibilities, to witness the eclipse would begin the countdown to the arrival of the comet with which their powers would increase as well as the rest of their abilities, since in addition to the individual powers that each one of them had. They all had a great physical endurance, a bit of strength over normal, if that was the case, it was possible that they could return for those who stayed behind. Or, the other option ... each of them would lose their powers, which would be absorbed by the nature of the comet, leaving them all helpless. Although, Suho sometimes thought about it, to ended without powers they could be humans ... Wasn’t that simpler? Suho spent several hours outside, thinking while walking. Analyzing the situation, remembering his members, their old home, trying to forget the bad memories, focusing on the smile that brought peace. It was when he returned home that he reviewed one of his last documents, they were solar registers. Finding nothing that seemed useful to him, he threw it to the other side of the room, repressing a sound of despair. He was tired of always finding dead ends. It was at that moment that he noticed one of the newspapers that were almost below the sofa on which he was sitting. Suho had always been a lover of knowledge and learning, that is why learning languages was an easy task and something that also enjoyed because it distract him a bit, perfectly mastering French. Focusing again on the newspaper, he noticed something unusual. There was a mention of a comet that would approach the planet. Where did this come from? It is impossible that I have not seen it before. Throughout the article he realized that they were not data that he did not know before, moreover the narrative seemed overrated and superficial. What made Suho interested was the photo attached to the news. There was a man who had supposedly given the interview. The supposed astronomical expert who besides his studies was a server in a church in a few cities of Marseille. What made Suho decide to look for a train to take him to that place were the decorations of that church was what had been behind that man. In it, the young man could differentiate various symbols engraved on the walls, signs that he knew very well. Each of the members had one that represented their essence or their powers and it and they were exposed in that church.